Other names: Jackal grape, kali dakh. Gidar kwar is a wild growing grape that grows from 600 to 2400 m on mountain slopes in the sub Himalayan region of India and Pakistan. In Pakistan, it occurs in Swat, Hazara and the Pakistan occupied Kashmir. Gidar kwar is, however, not wild everywhere. Some vegetatively propagated selections of this grape are under cultivation too in Pakistan and the fruits can be seen being sold at fruit shops in Muzaffarabad. It commonly grows along streams or regions of relatively high summer rainfall. A robust ligneous vine, younger branches, petiole, inflorescence and under surface of the leaves woolly tomentose, older branches and stem ± glabrous, tendril mostly bifurcate. 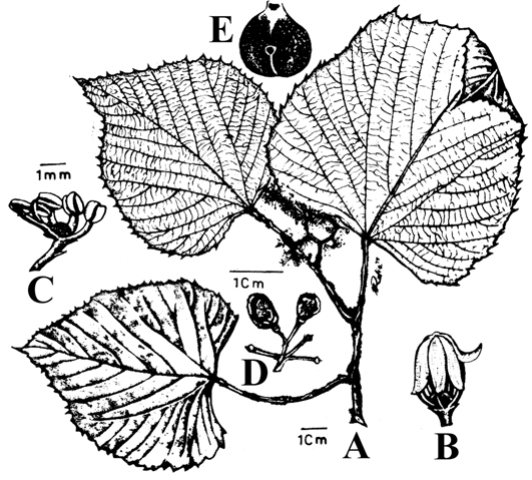 Leaves variable in size and shape, broadly ovate-cordate, rarely orbicular or truncate. 7-15 x 7-14 cm, lamina undivided, shallowy 3-lobed or 3-teethed, margin dentate-serrate acute or shortly accuminate mature leaves ± glabrous above, clothed with dense short woolly tomentum beneath turning rusting red in herbarium after few years, petiole 3-8 cm long. Peduncle 5-6 cm long, ± floccose. Flower if bisexual functionally female, minute c. 2 mm long, greenish, pedicel c. 3 mm long, glabrous thickened in fruit. Calyx cuplike, c. 0.5 mm across, petals 5 elliptic-lanceolate, 2x 1 mm. Disc with five confluent glands, ovary adnate to hypogynous disc, style absent, stigma short. Berry 10-13 mm wide, black, 50-100 per cluster which are 15-30 cm long. Seeds 1-3, obovoid with a short beak at the base and a spathulate tubercle on the back from which a ridge run over the top, ventral surface with 2 shallow linear grooves. Gidar kwar fruits are eaten fresh. These are juicy. The flesh has a pleasing flavour and a good sugar/acid ration. The fruits from cultivated selections are even better than those from wild growing vines. The fruits are offered for sale too. Unlike vinifera grapes, the gidar kwar berries are not affected rains. These have also been noted to be relatively less affect by diseases. So these can be grown at places where the rains start early in the season. Gidar kwar vines are grown in the same way as vinifera grapes. No special technology is involved.